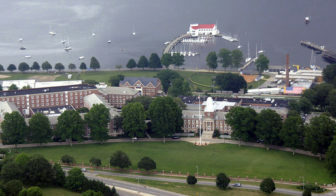 The U.S. Coast Guard Academy in New London. Washington – Federal investigators have determined the Coast Guard Academy in New London retaliated against a black, female officer after she complained she was bullied and harassed. Connecticut Sens. Richard Blumenthal and Chris Murphy have also requested information about complaints of racial discrimination at the academy. This story was updated on Dec. 5 to include comments from Sens. Richard Blumenthal and Chris Murphy.